The vast majority of the record his presidency left behind consists not of evocative handwritten notes, printed cable transmissions, and black-and-white photographs, but email, Word docs, and JPEGs. The question now is how to leverage its digital nature to make it maximally useful and used. This almost-entirely digital collection, and its unwieldy scale and multiple formats, should sound familiar to all of us. 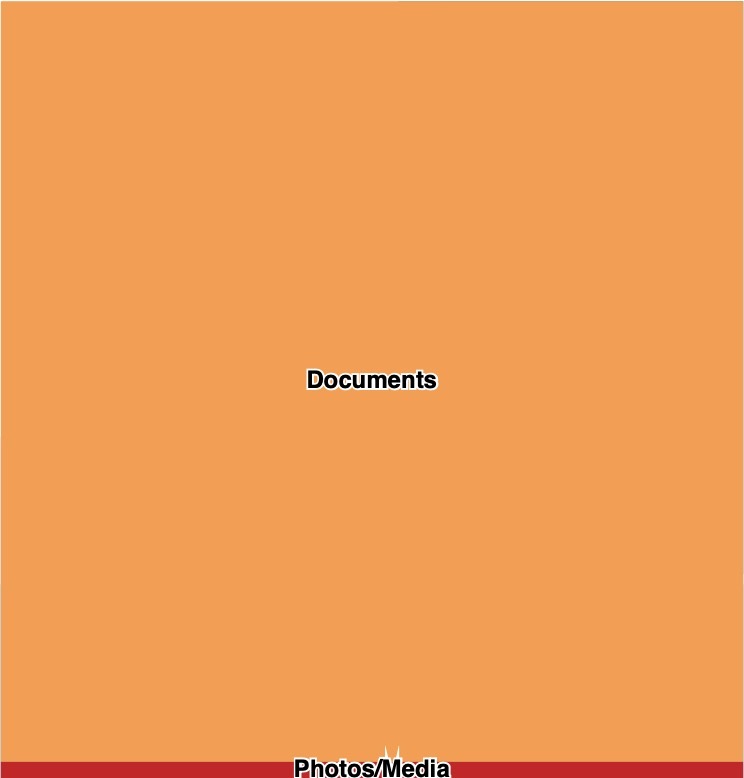 Over the past two decades, we have each become unwitting archivists for our own supersized collections, as we have adopted forms of communication that are prolific and easy to create, and that accumulate over time into numbers that dwarf our printed record and can easily mount into a pile of digital files that borders on shameful hoarding. I have over 300,000 email messages going back to my first email address in the 1990s (including an eye-watering 75,000 that I have sent), and 30,000 digital photos. This is what happens when work life meets Microsoft Office and our smartphone cameras meet kids and pets. Will we have lost something in this transition? Of course. Keeping a dedicated archival staff in close proximity to a bounded paper-based collection yields real benefits. Having a researcher who is on site discover a key note on the back of a typescript page is also special. Please do read the whole article for my thoughts about how we should approach the design of this digital library, and the possibilities it will enable, including broad access and new forms of research. When Roy Rosenzweig and I wrote Digital History 15 years ago, we spent a lot of time thinking about the overall tone and approach of the book. It seemed to us that there were, on the one hand, a lot of our colleagues in professional history who were adamantly opposed to the use of digital media and technology, and, on the other hand, a rapidly growing number of people outside the academy who were extremely enthusiastic about the application of computers and computer networks to every aspect of society. Reading passionate polemics such as these, Roy and I decided that it would be the animating theme of Digital History to find a sensible middle position between these two poles. Part of this approach was pragmatic—we wanted to understand how history could, and likely would, be created and disseminated given all of this new digital technology—but part of it was also temperamental and even a little personal for the two of us: we both loved history, including its very analog and tactile aspects of working with archives and printed works, but we were also both avid computer hobbyists and felt that the digital world could do some uncanny, unparalleled things. So we sought a profoundly humanistic, but also technologically sophisticated, position on which to base the pursuit of knowledge. 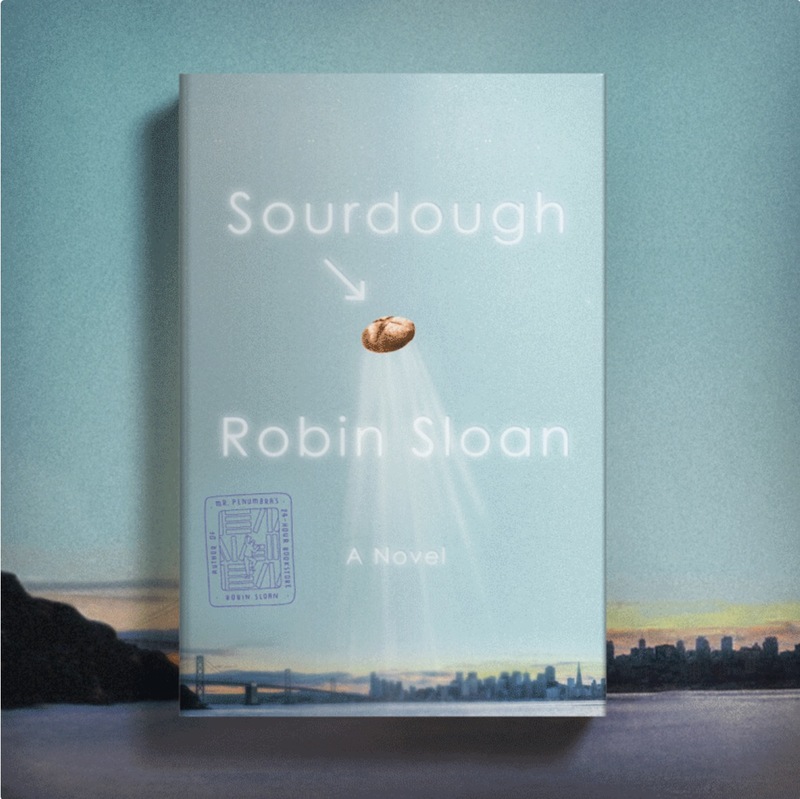 Robin Sloan is a novelist who has published two books, Mr. Penumbra’s 24-Hour Bookstore and Sourdough, that are very much about this intersection between the humanistic and the technological. Beyond his very successful work as an author, he has had a career at new media companies that are often associated with cyberenthusiasm, including Twitter and Current TV, and he has also spent considerable time engaging in crafts often associated with technoskepticism, including the production of artisanal olive oil, old-school printing, and 80s-era music-making. In this larger context of his vocations and avocations, his novels seem like an attempt to find that very same, if elusive, via media between the incredible power and potential of modern technology and the humanizing warmth of our prior, analog world. Unlike some other contemporary novelists and nonfiction writers who work in the often tense borderlands between the present and future, Sloan neither can bring himself to buy fully into the utopian dreams of Silicon Valley—although he’s clearly tickled and even wowed by the way it constantly produces unusual, boundless new tech—nor can he simply conclude that we should throw away our smartphones and move off the grid. Although he clearly loves the peculiar, inventive shapes and functions of older technology, he doesn’t badger us with a cynical jeremiad to return to some imagined purity inherent in, say, vinyl records, nor will he overdo it with an uncritical ode to our augmented-reality, gene-edited future. Instead, his helpful approach is to put the old and new into lively conversation with each other. In his first novel, Mr. Penumbra’s 24-Hour Bookstore, Sloan set the magic of an old bookstore in conversation with the full power of Google’s server farm. In his latest novel, Sourdough, he set the organic craft of the farmer’s market and the culinary artisanry of Chez Panisse in conversation with biohacked CRISPRed food and the automation of assembly robots. But this was in the published version of the novel. In a revealing abandoned first draft of Sourdough that Sloan made available (as a Risograph printing, of course) to those who subscribe to his newsletter, he started the novel rather differently. In the introduction to this discarded draft, titled Treasured Subscribers, Sloan briefly notes that “these were not the right characters doing the right things.” I think he’s absolutely right about that, but it’s worth unpacking exactly why, because in doing so we can understand a bit better how Sloan pursues that elusive via media, and how in turn we might discover and promote humane technology in a rapidly changing world. 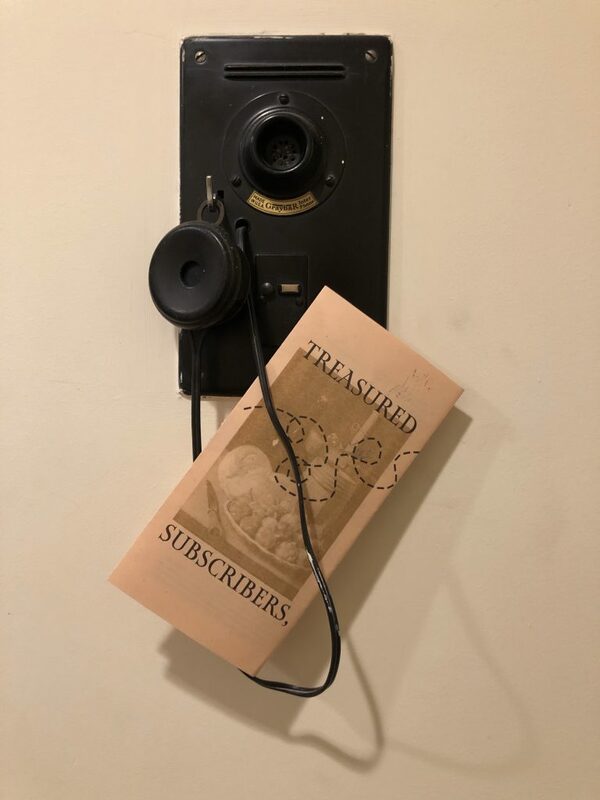 Treasured Subscribers begins with a similar overarching narrative concept as Sourdough: a capable, intelligent young woman moves to the Bay Area and becomes part of a mysterious underground organization that focuses on artisanal food, and that is orchestrated by a charismatic leader. Mina Fisher, a writer, lands a new marketing job at Intrepid Cellars, led by one Wolfram Wild, who refuses to carry a smartphone or use a laptop. Wild barks text and directions for his newsletter on craft food and wine offerings over what we can only assume is an aging Motorola flip phone as he travels to far-flung fields and vineyards. In short, Wild appears to be a kind of gastronomic J. Peterman, globetrotting for foodie finds. The only hint of future tech in Treasured Subscribers is a quick mention of “Chernobyl honey,” although it’s framed as just another oddball discovery rather than—as Sourdough makes much more plain—an intriguing exercise in modding traditional food through science-fiction-y means. Wild seems too busy tracking down a cider mentioned by Flaubert to think about, or articulate, the significance of irradiated apiaries. By itself, this seems like not such a bad setup for a novel, but the problem here is that if one wishes to explore, maximally, the intersection and possibilities of human craft and high tech, one can’t have a flattened figure like Wolfram Wild, who sticks with Windows 95 on an aging PC tower. (Given the implicit nod to Stephen Wolfram in Wild’s name, I wonder if Sloan planned to eventually reveal other computational layers to the character, but it’s not there in the first chapter.) In order for Sloan’s fiction to consider the tension between technoskepticism and cyberenthusiasm, and to find some potential resolution that is both excitingly technological and reassuringly human, he can’t have straw men at either pole. Had Sloan continued with Treasured Subscribers, it would have been all too easy for the reader to dismiss Wild, cheer for Mina, and resolve any artisanal/digital divide in favor of an app for aged Bordeaux. To generate some real debate in the reader’s mind, you need more multidimensional, sophisticated characters who can speak cogently and passionately about the advantages of technology, while also being cognizant of the impact of that technology on society. A clamshell cellphone-brandishing foodie J. Peterman won’t do. Sloan solved this problem in multiple ways in the production version of Sourdough. In the published novel, the protagonist is the young Lois Clary, a software developer who gets a job automating robot arms at General Dexterity, and learns baking at night from two lively undocumented immigrants and their equally animated starter dough. General Dexterity is led by a charismatic tech leader, Andrei, who can articulate the remarkable features of robotic hands and their potential role in work. Also hanging out at the unabashed cyberenthusiast pole, ready for conversation and debate, is the founder and CEO of Slurry Systems, the maker of artificial, nutritious, and disgusting foods of the future, Dr. Klamath. And Clary ends up working at—yes, here it returns from Treasured Subscribers, but in a different form—an underground craft food market, which is chockablock with artisanal cheeses and beverages made by off-duty scientists and a librarian who maintains a San Francisco version of the New York Public Library’s menu collection. Tech and craft are in rich, helpful collision. The most important character, however, for our purposes here, is the delightfully named Charlotte Clingstone, who is the head of the legendary Café Candide, and the stand-in for Alice Waters of Chez Panisse fame. Chez Panisse, in Berkeley, pioneered the locavore craft food movement, and normally a fictional Waters would be a novel’s unrelenting resident technoskeptic. But in a key twist, it turns out at the end of Sourdough that Clingstone also underwrites futuristic high-tech foodie endeavors—including that “Chernobyl honey” that is a carryover from Treasured Subscribers. Clingstone both defends the craft of the farm-to-table kitchen while seeing it as important to explore the next phase of food through robotics, radiation, and RNA. As Sourdough develops with these characters, it can thus ask in a deeper way than Treasured Subscribers whether and how we can fuse tech know-how with humanistic values; whether it’s possible to exist in a world in which a robotic hand kneads dough but the process also involves an organic, magical yeast and well-paid workers; whether that starter dough should be gene sequenced to produce artificial, nutritious, and delicious food at scale; and how craft-worthy human labor and creativity can exist in the algorithmic, technological society that is quickly approaching. The only way to find out is to experiment with the technical and digital while keeping one’s heart in the mode of more traditional human pursuits. Sloan’s protagonist, Lois, thus follows an emotional arc between developing code and developing bread. I suppose we shouldn’t make that much of an abandoned first draft of a novel (he says 1,000 words into an exploratory blog post), but reading Treasured Subscribers has made me think again about the right middle way between technoskepticism and cyberenthusiasm that we tried to find in Digital History. Certainly the skepticism side has been on the sharp ascent as Silicon Valley has continually been tone-deaf and inhumane in important areas like privacy. Certainly we need a good healthy dose of that criticism, which is valid. But at the end of the day, when it’s time to put down the newspaper and pick up the novel, Robin Sloan holds out hope for some forms of sophisticated technology that are attuned to and serve humanistic ends. We need a bit of that hope, too. Robin Sloan is willing to give both the artisanal and the technical their own proper limelight and honest appraisal. Indeed, much of what makes his writing both fun and thoughtful is that rather than toning down cyberenthusiasm and technoskepticism to find a sensible middle, he instead uses fiction to turn them up to 11 and toward each other, to see what new harmonious sounds, if any, emerge from the cacophony. Sloan looks for the white light from the overlapping bright colors of the analog and digital worlds. Like the synthesizers he also loves—robotic computer loops intertwined with the soul of music—he seeks the fusion of the radically technological and the profoundly human. Buried in the recent debates (New York Times, Chicago Tribune, The Public Historian) about the nature, objectives, and location of the Obama Presidential Center is the inexorable move toward a world in which virtually all of the documentation about our lives is digital. To make this decades-long shift—now almost complete—clear, I made the following infographic comparing three representative presidential libraries, each a generation apart: LBJ’s, Bill Clinton’s, and Barack Obama’s. 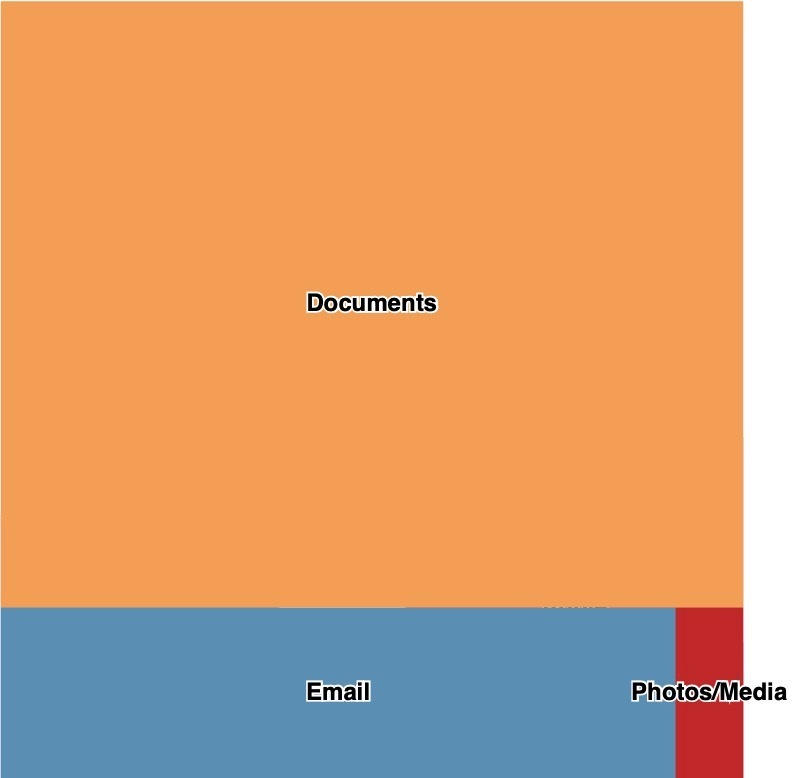 Each square represents the relative overall size of these presidential archives—roughly 46 million pages for LBJ, 100 million for Clinton, and 360 million for Obama—as well as the basic categories of archival material: paper documents, photographs and audiovisual media, and, starting with Clinton, email. We are still in the process of assessing all that will go into the Obama Presidential Library (other libraries have added considerable new caches of documents over time), but the rough initial count from the U.S. National Archives and Records Administration is that there are about 300 million emails from Obama’s eight years in the White House, and about 30 million pages of paper documents. 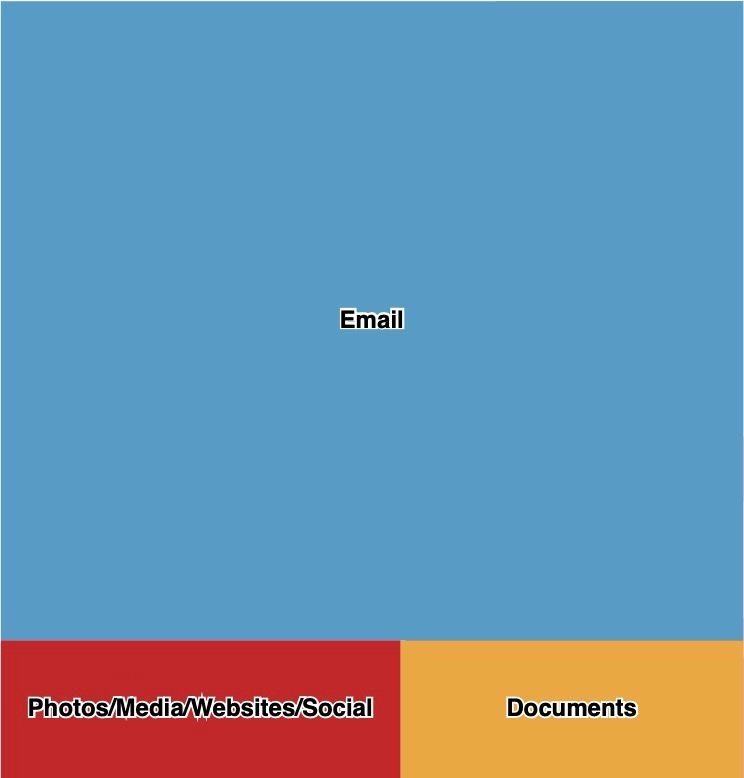 The chart above would be even more email-centric for Obama’s library if I used NARA’s calculation of a few paper pages per email, which would equal over a billion pages in printed form. In other words, using a more rigorous comparison at best only 3% of the Obama record is print vs. digital. It’s unfortunate that it’s still relatively expensive and time-consuming to digitize analog materials. Nearly two decades on, the Clinton Presidential Library has only digitized about 1% of their paper holdings (about 700,000 pages). The Reagan Presidential Library charges $.80 to digitize one page of his archives. The Obama Presidential Center’s commitment to funding the complete digitization of those 30 million paper pages, in what seems like a more rapid fashion and with open access to the public, seems rather laudable in this context. Meanwhile, all of us have more quietly followed the same path, with only a very small percentage of our overall record now existing in physical formats rather than bits. How we will preserve this heterogeneous and perhaps ephemeral digital record when we don’t have our own presidential libraries and the resources of NARA is a different and more worrisome story. Generosity and thoughtfulness are not in abundance right now, and so Kathleen Fitzpatrick‘s important new book, Generous Thinking: A Radical Approach to Saving the University, is wholeheartedly welcome. The generosity Kathleen seeks relates to lost virtues, such as listening to others and deconstructing barriers between groups. As such, Generous Thinking can be helpfully read alongside of Alan Jacobs’s How to Think, as both promote humility and perspective-taking as part of a much-needed, but depressingly difficult, re-socialization. Today’s polarization and social media only make this harder. Fitzpatrick’s analysis of the university’s self-inflicted wounds is painful to acknowledge for those of us in the academy, but undoubtedly true. Scholars are almost engineered to cast a critical eye on all that passes before them, and few articulate their work well to broader audiences. Administrators are paying less attention than in the past to the communities that surround their campuses. Perhaps worst of all, the incentive structures of universities, such as the tenure process and college rankings, strongly reinforce these issues. I read Generous Thinking in a draft form last year and thought an appropriate alternate title might be The Permeable University. Many of Fitzpatrick’s prescriptions involve dissolving the membrane of the academy so that it can integrate in a mutually beneficial way with the outside world, on an individual and institutional level. You will be unsurprised to hear that I agree completely with many of her suggestions, such as open access to scholarly resources and the importance of scholars engaging with the public. Like Fitzpatrick, I have had a career path that has alternated between the nonprofit and academic worlds in the pursuit of platforms and initiatives that try to maximize those values. With universities currently receiving withering criticism from both the right and left, it is critical for all of us in the academy to take Generous Thinking seriously, and to think about other concrete steps we can take to open our doors and serve the wider public. The deep incentive structures will be very hard to change, but we can all take more modest steps such as thinking about how new media like podcasts can play a role in a more publicly approachable and helpful university, or how we might be able to provide services (e.g., archival services) to local communities. Fitzpatrick’s Humanities Commons, a site for scholars to connect not just with each other but with the public, is another venue for making the generosity she seeks a reality. Much more needs to be done on this front, and so I encourage you to read Kathleen Fitzpatrick’s new book. It’s great to be back here in Andover Hall. I received a master’s degree in theological studies from Harvard Divinity School, and being in this chapel reminds me of what I was thinking about during my two years studying the history of religion. It is, perhaps surprisingly, germane to what I want to talk about today. Studying religion means studying the biggest questions, the unanswerable questions. The study of religion is, necessarily, humbling. If it occasionally approaches higher truths, it also reminds us that human knowledge is woefully incomplete and fallible. But this fallibility and the way we stumble toward the truth is not communicated regularly or well by academia to the outside world. Our formal communications take other forms that are more, shall we say, braggadocious. The academic monograph and article are necessarily shaped to show off expertise. These written forms have scholarly accoutrements, like the jewelry of footnotes, that make them dressed to impress. Mostly, of course, they are dressed to impress one’s peers. Genres prep the podcast listener’s ears and mind through repetition, recognition,and expectation. Conforming to a genre telegraphs structural information to the audience and makes audio more palatable and relatable. Podcast elements like intro and outro music, for instance, are genre-building. They orient the listener, who after all might be tuning in for the first time, and communicate what kind of audio stream this is. This conference is about podcasts, but there can be and indeed are many genres of podcasts. Podcasts no longer occupy the vast spectrum from two white guys talking about technology to three white guys talking about technology. What this conference represents is a wonderful flourishing of podcast genres. Now we need to think more about the kinds of genres that academic work works well in, and that can take maximal advantage of the medium and have the maximal impact. So let’s talk about how to situate educational and academic podcasts within the galaxy of possible genres. We can take some helpful clues about this situation from other new media formats that have flourished on the web over the past quarter-century. For instance, since the advent of the web, and its ability to serve a wide array of text, in different lengths, sizes, and contexts, we have seen the birth of new genres that challenge traditional writing and break out of the constraints of print publication. Take the blog. Originally a “web log” of interesting links, it evolved two decades ago in places like LiveJournal into personal musings and then in other platforms like MoveableType and ultimately WordPress into a fairly flexible, but always recognizable, reverse chronological, largely textual genre, one that accommodates posts of different lengths and purposes. Because it lived on the web, and given its origins, the blog was colonized by a less formal, more freeform style that beneficially allowed academics who started blogs to loosen up a bit. I moment ago I used the word braggadocious. I would feel, shall we say, uncomfortable using that word in an academic article in my native field of history, but I’ve owned the domain dancohen.org for 20 years now and if I want to drop a braggadocious or two in a blog post there so be it. The blog excels, in extraordinarily helpful ways, in portraying this process, and so we now have the distinct genre of the process blog. For example, one of the blogs I subscribe to is by a particle physicist who is providing daily updates on the fusion reactor his team is building. That is just plain cool, but will never appear in his submissions to physics journals. I have colleagues in history who blog about the ups and downs of archival research, the rare finds and the drudgery, the thousands of hours of research and writing. Those sentiments, revealed in a blog, and can enrich and humanize academic work. Also, like a good movie, a successful article or book leaves on the cutting room floor dozens of other great scenes, half-baked but still pretty tasty thoughts, and possible connections that must wait until another time, or be forgotten forever. A blog can document the incredible swirl of evidence and thinking and knowledge that emerges out of an academic project. Blogging can be a powerful way to provide “notes from the field” and ongoing glosses in research areas that perhaps only a handful of others worldwide know much about, but that may fascinate the wider world if framed well. Podcasts provide a fantastic opportunity, in many ways much better than the blog, to communicate the complex processes involved in acquiring new knowledge and passing it on to students and the public, and to show the bumps along the road, and the methods and heartache and excitement along the way. For instance, last week on our What’s New podcast, we had a brilliant young biochemist, Heather Clark, on to talk about the nanosensors her lab is creating to determine the level of certain chemicals in the body. They custom design extraordinarily tiny molecules that light up when they find lithium or sodium in the bloodstream, and an electronic tattoo on the skin can then register and transmit that information. This is truly the stuff of science fiction, but the best part of the podcast was Heather’s response to my question about how such nanotechnology is actually created. We hear this word “nanotechnology” all the time in the news, but do you have any idea what it actually looks like in practice? I didn’t. So I asked Heather to describe what goes on in her lab during a normal day. And she digressed into a remarkable discussion of how making nanosensors actually looks a lot like making salad dressing—literally mixing various oils and ingredients together to make the right blend. And she’s laughing as she’s describing this process because on the one hand it’s kitchen counter work, but on the other hand it’s a profound synthesis of physics, biology, chemistry, and engineering. As Heather revealed these scientific principles and bench-science techniques, I couldn’t help but think of how magical, alchemical, her work is. Indeed, podcasts can frame academic expertise in a way that can thrill an audience because of this magical element. Teller, the shorter, quieter magician in Penn & Teller, has made the point that a big part of what makes magic what it is is that magicians will spend an unbelievable amount of time practicing a very specific skill or pursuing a trick, far more time than the audience considers humanly possible. By this definition there is a lot of magic in the academy. Our colleagues spend years or even decades deciphering papyri, learning long-lost languages, trying to solve fantastically complex mathematical theorems, or tracking down the smallest bits of evidence or assembling the largest imaginable data sets. Audio, done well, can display this incredible obsession to audiences, and as Teller notes, revealing how a magic trick is done—by grit and practice and sheer will—often enhances appreciation for magic rather than dissipating it. Finally, and most importantly, podcasts have an unparalleled ability to convey the reality of academic work, and inculcate appreciation of it—better than the blog because of the nature of audio and especially the unique character of the human voice. From the time we are babies, we respond differently to voices than to other sounds in our world. As the most social of animals, we are incredibly adept at picking up subtle cues from the human voice—excitement, nervousness, ambivalence, assurance. The human voice can thus communicate one’s humanity to the listener in a way that most academic writing has enormous trouble with—and as I noted earlier, was never really structured to do. But it has to be the right type of voice, a topic of many of the sessions at this conference today. If you are an academic, are you projecting a know-it-all voice, the voice of the article and the academic monograph, or the more cautious, thoughtful voice that is really in your head as you pursue your research? Are you merely recounting the end results of a process, or pulling the curtain back and showing the human—and often engrossing—processes behind the discoveries? Academic podcasts are often criticized as raw and unedited, but they can take advantage of this lack of polish in comparison to a monograph or an article. In podcasts, we can hear a potent and unique combination of the expertise of academics with the informality of extemporaneous speech. 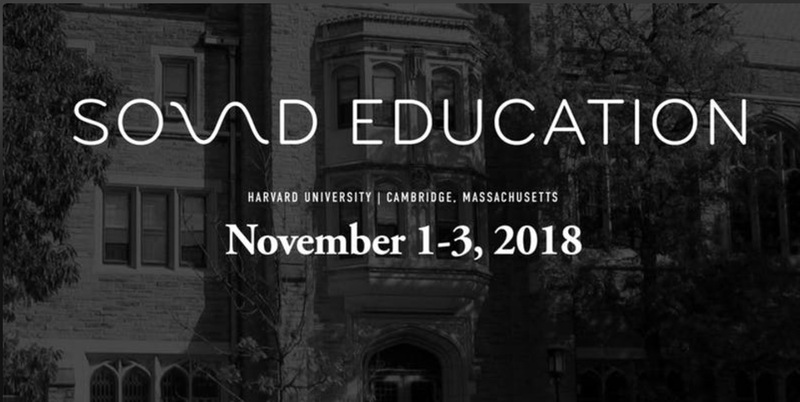 Done well, educational podcasts as a whole, the range of podcasts represented here today, can foster audiences who may not always agree with us or our research or conclusions, but who can grasp much more deeply the very human pursuits of the academy and see how those pursuits relate to their own lives. Critically, this has never been more important, as there is a growing skepticism about the value of the academy. All universities are struggling with how to communicate their worth to the public. In his recent book How to Think: A Survival Guide for a World at Odds, literary scholar Alan Jacobs calls on us to foster what he calls “like-hearted, rather than like-minded” audiences. We are never to get everyone to agree with us about everything, but that shouldn’t be our ultimate goal. We should instead seek to cultivate receptivity to academic subjects again, and that hard work isn’t being adequately done through our formal writing or press releases. Podcasts give us the opportunity to show the humanity and relevance and relatability of academic practice, something that significant portions of the public have lost sight of. Your podcast can be an important addition to this humanizing goal, one more step in expanding the audience of curious listeners, and the general population of the like-hearted. This is a topic that should be of urgent interest to everyone since the themes of the report, although heightened due to the more active digital practices of young people, capture how we all find and digest news today, and also points to where such consumption is heading. On a personal level, I was thrilled to be a part of this study as a librarian who wants students to develop good habits of truth-seeking, and as an intellectual historian, who has studied changing approaches to truth-seeking over time. 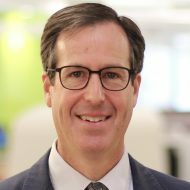 You should first read the entire report, or at least the executive summary, now available on a special site at Project Information Literacy, with data hosted at Northeastern University Library’s Digital Repository System (where the study will also have its long-term, preserved form). It’s been great to work with, and think along with, the lead study members, including Alison Head, John Wihbey, Pakis Metaxas, and Margy MacMillan. “How Students Engage with News” details how college students are overwhelmed by the flood of information they see every day on multiple websites and in numerous apps, an outcome of their extraordinarily frequent attention to smartphones and social media. Students are interested in news, and want to know what’s going on, but given the sheer scale and sources of news, they find themselves somewhat paralyzed. As humans naturally do in such situations, students often satisfice in terms of news sources—accepting “good enough,” proximate (from friends or media) descriptions rather than seeking out multiple perspectives or going to “canonical” sources of news, like newspapers. Furthermore, much of what they consume is visual rather than textual—internet genres like memes, gifs, and short videos play an outsized role in their digestion of the day’s events. (Side note: After recently seeing Yale Art Gallery’s show “Seriously Funny: Caricature Through the Centuries,” I think there’s a good article to be written about the historical parallels between today’s visual memes and political cartoons from the past.) Of course, the entire population faces the same issues around our media ecology, but students are an extreme case. And perhaps also a cautionary tale. I think this study’s analysis and large survey size (nearly 6,000 students from a wide variety of institutions) should be a wake-up call for those of us who care about the future of the news and the truth. What will happen to the careful ways we pursue an accurate understanding of what is happening in the world by weighing information sources and developing methods for verifying what one hears, sees, and reads? Librarians, for instance, used to be much more of a go-to source for students to find reliable sources of the truth, but the study shows that only 7% of students today have consulted their friendly local librarian. It is incumbent upon us to change this. A purely technological approach—for instance, “improving” social media feeds through “better” algorithms—will not truly solve the major issues identified in the news consumption study, since students will still be overwhelmed by the volume, context, and heterogeneity of news sources. A more active stance by librarians, journalists, educators, and others who convey truth-seeking habits is essential. Along these lines, for example, we’ve greatly increased the number of workshops on digital research, information literacy, and related topics at Northeastern University Library, and students are eager attendees at these workshops. We will continue to find other ways to get out from behind our desks and connect more with students where they are. Finally, I have used the word “habit” very consciously throughout this post, since inculcating and developing more healthy habits around news consumption will also be critical. Alan Jacobs’ notion of cultivating “temporal bandwidth” is similar to what I imagine will have to happen in this generation—habits and social norms that push against the constant now of social media, and stretch and temper our understanding of events beyond our unhealthily caffeinated present. You don’t see it until you’re right there, and even then, you remain confused. Did you miss a turn in the road, or misread the map? You are now driving through someone’s yard, or maybe even their house. You slow to a stop. On rural road R575, also known as the Ring of Beara and more recently rebranded as part of the Wild Atlantic Way, you are making your way along the northern coast of the Beara Peninsula in far southwestern Ireland. You are in the hamlet of Gortahig, between Eyeries, a multicolored strip of connected houses on the bay, and Allihies, where the copper mines once flourished. The road, like the landscape, is raw, and it is disconcertingly narrow, often too narrow for two cars to pass one another. But not as narrow as what you suddenly see in front of you, which seems too thin for even one car. This road that strings together the scenic green towns of the peninsula into a jade necklace somehow threads its way between an old house and an old shed at a 45-degree angle. Even in a small car, you take your time making your way through, so as not to hit the buildings that crowd the road. A stern sheep looks down at you from the hill nearby. The answer, of course, is that they don’t. Arriving in the next town, you ask at the pub about the narrow passage behind you, and the bartender fills you in. No, large vehicles can’t get through there. If they leave from Eyeries or Allihies, when they get to that house they realize they can’t go any further, and they have to back up a mile or more just to turn around — in reverse on a winding mountain road that has drop-offs into the Atlantic. 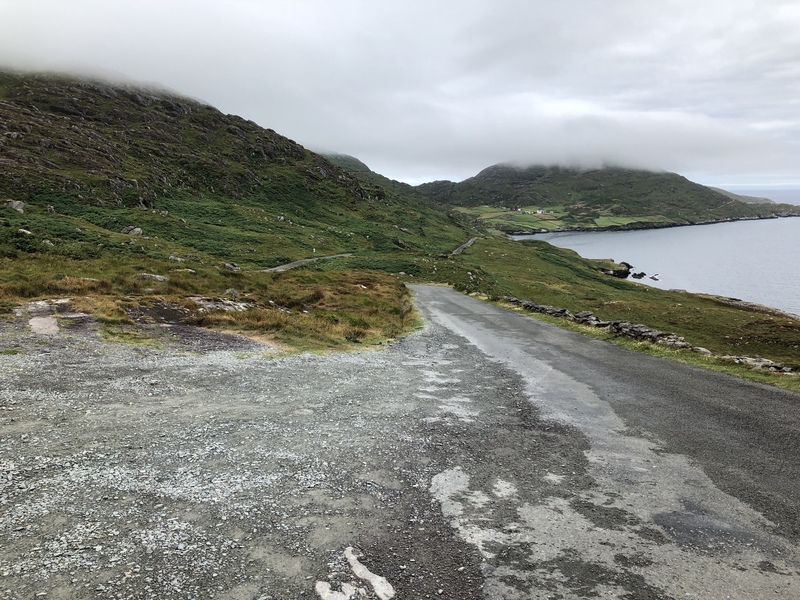 So this narrow passage of Gortahig restricts movement along the main circulating road of the Beara Peninsula — a choke point of a hundred feet along a hundred-mile stretch. Have they ever thought about, you know, widening the road? Well, it is someone’s house and shed, you’re gently told, a family that’s lived there a long time. Some years ago, the owner evidently offered to let the shed be knocked down to open some more room for the road, but others in west Cork County weren’t passionate about forcing that change. The only group motivated to alter the road were the tour companies that wanted to send large coaches around the Ring of Beara, like they do on the next peninsula over, Kerry. Given the history of the property and the cost of a new road, the majority decided just to let things be. So the narrow passage of Gortahig remains. And as you think more about it, the more you realize how much this tiny dot on the map changes everything in western Ireland. 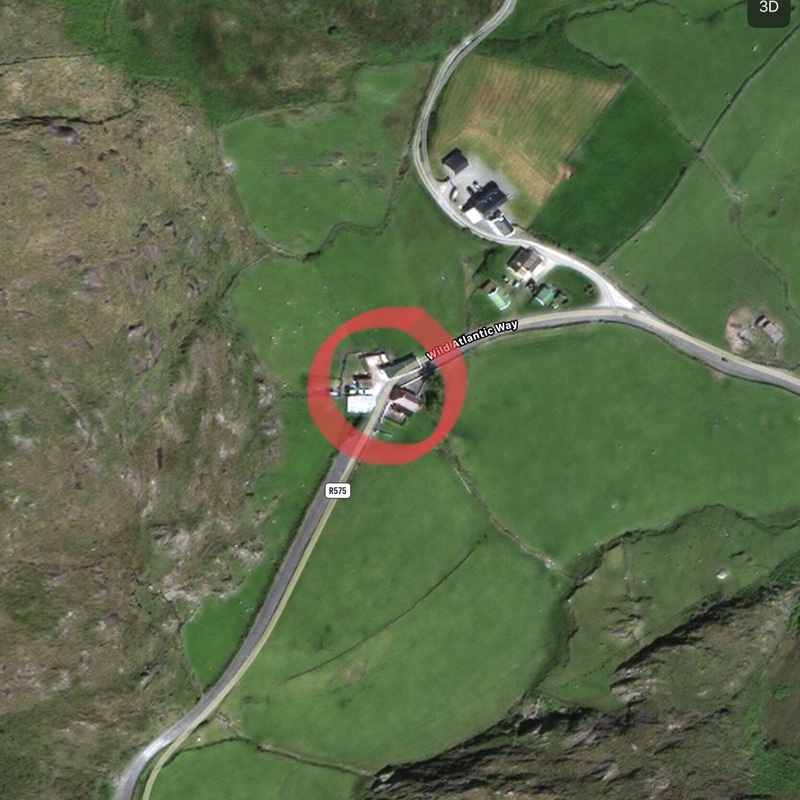 Because the big tour buses can’t make it around the Ring of Beara, they stick to the Ring of Kerry. 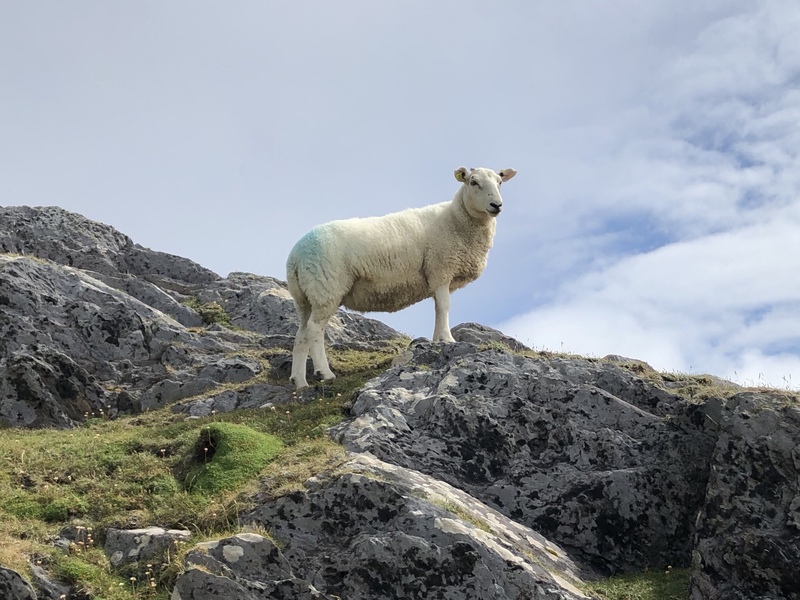 Because they stick to the Ring of Kerry, that peninsula to the north has dramatically more tourists than Beara, even though they are equally beautiful. Because there are far fewer tourists on Beara, large hotels haven’t been established there like they have been across Kerry. Because there aren’t many hotels or tourist infrastructure, the scene on Beara is decidedly calmer, smaller, and more local. When you arrive in Castletownbere, the largest, but still rather small, town on the Beara Peninsula, you notice that it remains primarily an active fishing port, despite abundant natural beauty and an island just off the coast with medieval ruins. It’s a tourist magnet with the polarity reversed. The fair that comes to Castletownbere in August doesn’t have the pop acts that show up for Galway’s summer arts festival, but it does feature an egg toss and a fish packing box stacking contest.